Abilities Not Disabilities – Page 3 – Increase awareness of activities, events and laws that make it easier for the disabled to participate in all aspects of life. Last night I attended my first advisory board meeting at the Salem County location (Pennsville, NJ) and was impressed with all of the programs that they have. They are a community based program that is open to all people with disabilities, their able-bodied friends and supporters. The board members and their executive director, Lisa Killion-Smith, are very enthusiastic and creative in providing programs and services. Their core services include independent living skills training, information and referral services, transitions, peer support and advocacy. They promote personal growth and empowerment through choice, self-determination and by participation in their programs which provide information, education, skills development and networking opportunities. Their regular and on-going events are free to their consumers and becoming a consumer is free of charge by calling their offices to register for their events. I would encourage the reader to go to their website at rilnj.org or send them an email at inforilnj.org to get more information. As a quick overview, they have the following on-going activities and events: Choice Support Group, Lego Therapy, Art and Music Therapy, Yoga and Computer Lab. Please contact them directly because they have other services and I don’t want to leave out something because I am still learning about their organization. I have been talking to my friends, family and anyone that will listen to get the word out that I have created this blog. Paul, at Blogfinger.net (who I consider a mentor and has a very successful blog) told me that I need to send out the address of the blog to everyone I know and ask them to share it with others and send me their thoughts. I am not looking for positive comments about the blog because it is still developing and it has a long way to go. The blog will grow and develop when others participate, send comments, add activities and events, pose questions and volunteer to provide their own experiences. Please feel free to send this to anyone that you know and send me your comments and activities / events. All the best to everyone. Consultant : Victoria Yuhasz 856-339-8622 or 856-451-1207 ext. 8622. The Personal Assistance Services Program (PASP) is a self-directed program that provides routine, non-medical assistance to adults with disabilities who are attending school, employed or involved in community volunteer work. Personal assistants help with tasks such as meal preparation, light housekeeping, bathing, dressing, shopping, and driving or using public transportation. The total number of hours a person can receive is based on the individual, up to a maximum of 40 hours per week. To be eligible, you must reside in NJ, have a permanent physical disability, be between 18 and 70 years old, be capable of directing your own services and be employed, volunteering or in school. For more information call Salem County ADRC at (856) 339-8622. The Registry is used by first responders (Police, Fire, Sheriff Officers, Emergency Medical Services, Health Department Personnel, and if necessary, the Army National Guard) to assist in relocating our residents prior to an emergency situation. The Special Needs Registry is free, strictly confidential, and completely voluntary. For more information or to get signed up, call our office at (856)-339-8622. Project Lifesaver works in conjunction with the Salem County Sheriff’s Office to protect wandering patients and give peace of mind to caregivers, families and communities. It’s an innovative rapid response program aiding victims and families suffering from Alzheimer’s disease and related disorders such as Down syndrome and Autism. It forms partnerships with local law enforcement and public safety organizations to deploy specially trained teams with the most reliable technology available to quickly locate and return wandering adults and children to their families and caregivers. Advisory Board Meetings: 6 times a year during: January, March, May , July Sept, and November. Our mission is to empower people with disabilities to become self-advocates and to live independently in the community. 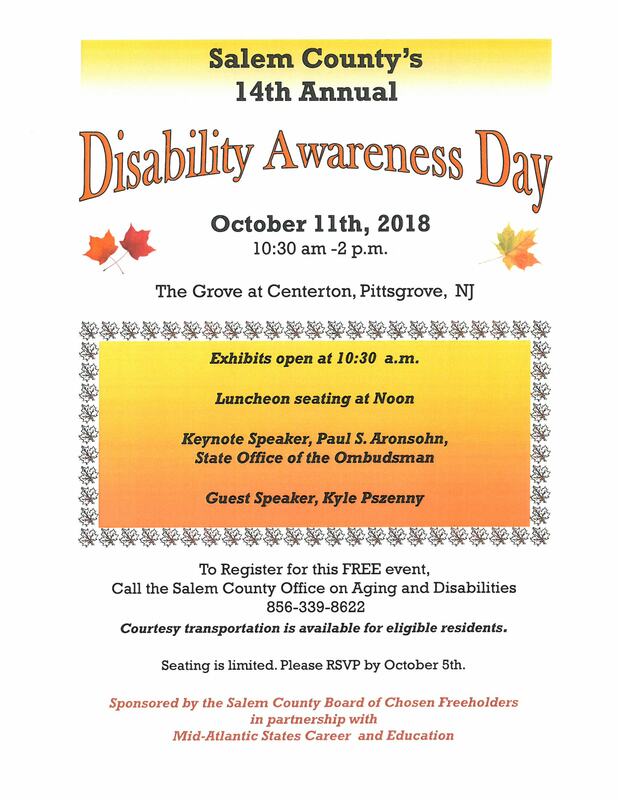 Disability Awareness Day is scheduled for October 11, 2018. Although this is an annual program, there is a change of location from the Riverview Restaurant in Pennsville to the Centerton Country Club in Pittsgrove. Please call the Disability Services Office at (856) 339-8622 to register and get more information. This is my first post on my very first blog. The genesis of this blog is a number of discussions with other board members on the Office for the Disabled advisory council about what we want to do as members of the advisory council. Basically, we are an advisory council to a department that is connected to the Office of Aging and our department is the one with a very small budget. There is a lot more money for seniors than for the disabled population. As we talked about what we wanted to do, we realized that the lack of funding limited what could be done. The idea of an interactive website kept coming up and the idea of a blog was mentioned. We wanted a method to provide timely information about activities and events that our disabled population might want to participate. Right now, no one knows about this site and I am really just writing my thoughts about an idea that has been discussed for a long time. If you happen to see this site, send me an e-mail at fhentz@hotmail.com until I figure out how to navigate my blog. I am not sure how the comment section works yet, but try to leave a comment. Suggestions and ideas: please feel free to be as open and honest as you can be so I can learn from this process and improve this site. Who will be my first visitor and what do they have to say?